whisk egg and add to dried fruit with 2/3 of the caster sugar. Sieve the dry ingredients and add to the fruit, along with the juice of the orange. The mixture should be moist so add some of the reserved tea liquor if necessary. pour into a greased and lined large round cake tin or 2 muffin trays and bake for 25mins. Cover with foil and bake for a further 45mins. If necessary, bake until your skewer comes out clean. Allow to cool before topping. melt golden syrup and add fruit and candied fruit. Simmer for 5 mins. put the kettle on, make a pot of tea and enjoy! 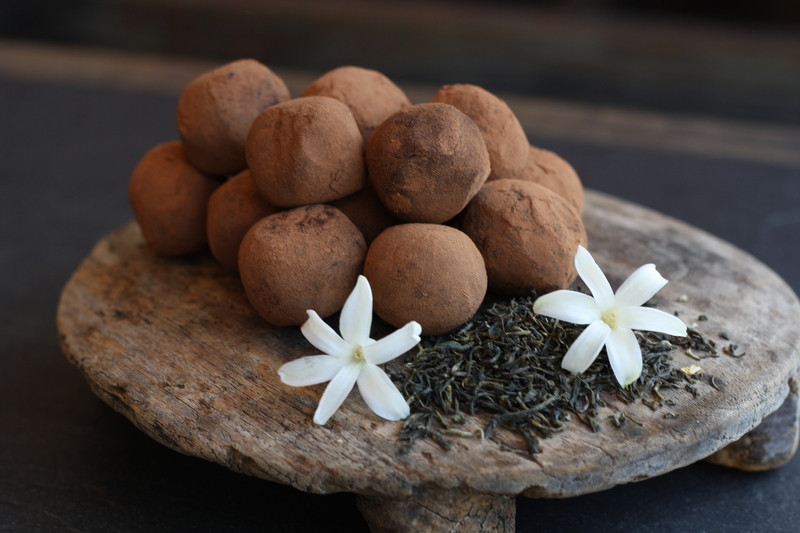 Our star recipe this month is this satisfying and indulgent Earl Grey chocolate cake, one of the regulars at the Lahloo Pantry counter – it never lasts long, as you can imagine! With a decadent chocolate glaze and fresh raspberries to decorate, this cake screams romance, so it’s perfect for your Valentine! Preheat the oven to 180ºC/ gas mark 4. Spray a circular tray with vegetable cooking spray, rubbing it with a paper towel, then lightly flour it, tipping out any excess. Pour the boiling water over the tea leaves in a small bowl. Steep, cover for 5 minutes, and strain. In a large bowl, combine the flour, sugar, cocoa, bicarbonate of soda, baking powder and salt. Whisk thoroughly. Add one cup of the steeped tea, reserving the remaining for the glaze. Add the buttermilk, melted butter and eggs. Using an electric mixer on medium high, beat the mixture for 2 minutes. Scrape down the sides of the bowl and mix for another 2 minutes, until smooth. The batter will be thin. Pour into the prepared tray. Bake for 30-45 minutes. Take out and leave to cool for for 15 minutes, then put the cake onto a cooling rack for a further 10 minutes. In a bain-Marie, heat the chocolate and the butter until just melted. Heat the reserved cup of tea in the microwave for 30 seconds until hot, then stir into the chocolate. The mixture will thicken; stir until smooth and pourable. Spoon the glaze over the cake using the back of the spoon and spread lightly. Decorate with raspberries. Let to set for an hour, then serve at room temperature. The cake may also be frozen. Once you try it, it’s hard not to become slightly obsessed with Sobacha, our caffeine-free roasted buckwheat tea. Nutty and moreish, it contains a healthy dose of vitamin B which makes it an uplifting cuppa, especially good during the winter months. Unlike what one might expect, buckwheat is not related to wheat. It’s a gluten-free grain that is generally used to make noodles (soba noodles!) and a delicious porridge. But it’s also very versatile! 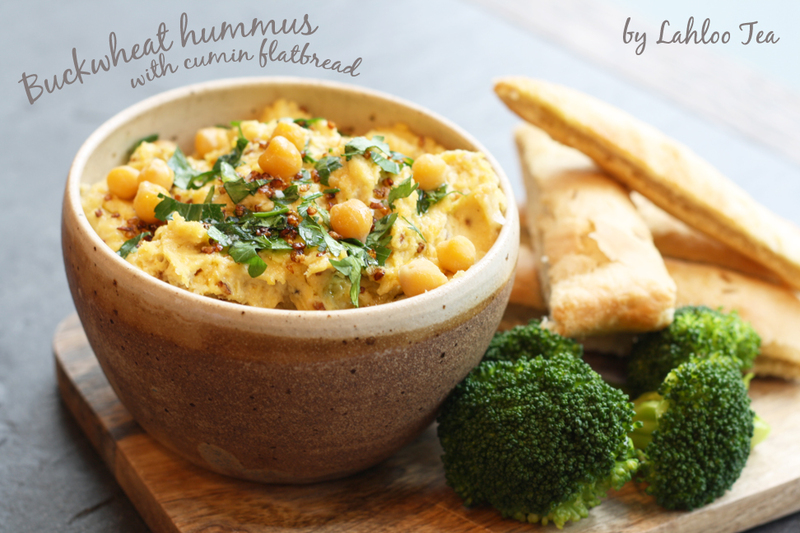 For this recipe, we’ve added Sobacha to a traditional hummus recipe for a surprisingly nutty twist. Serve with strips of delicious homemade cumin flatbread. 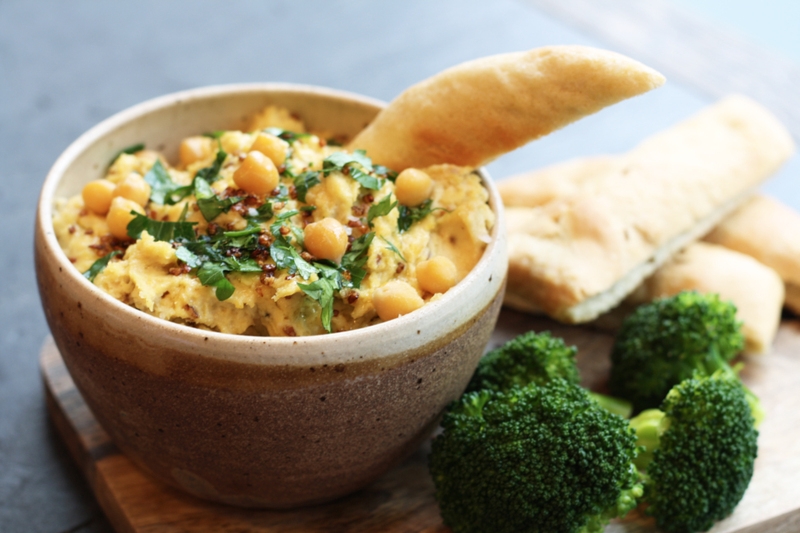 Place the chickpeas in a blender with lemon juice, garlic, tahini, olive oil, Sobacha and cumin seeds. Blend until smooth, adding up to 200ml of water to create a smooth consistency. Garnish the hummus with more Sobacha and leftover chickpeas, sprinkling chopped parsley and a dash of olive oil over the top. Use a dough hook and bring together the ingredients. Cover and allow to rise for 1h. 15 minutes before you start shaping the bread, preheat the oven at 180C. Shape the dough into 3 small balls, sprinkle with cumin seeds and bake for 15-20 mins. If, like us, you’ve started the year with the resolution of going (nearly or completely!) caffeine-free, this detox water may be your saviour! Peppermint, cucumber, lemon and lime create a refreshing, invigorating and purifying drink – handy when you have to work in front of the screen for hours! Best of all, it’s very easy to prepare. 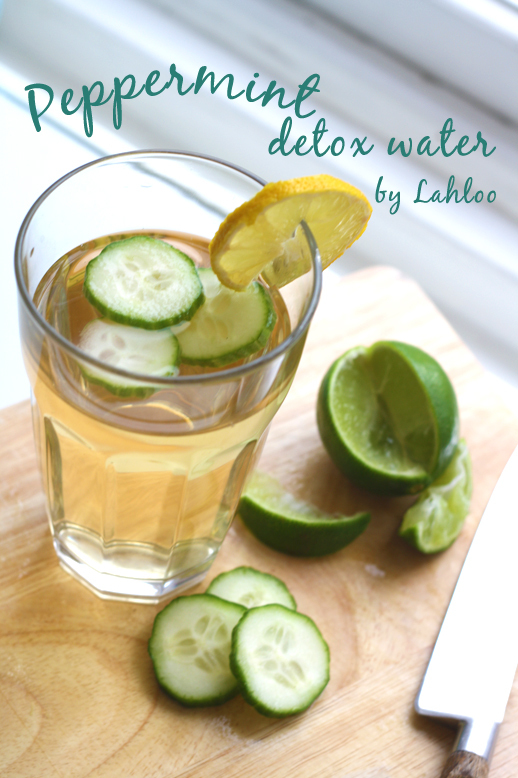 Cold infuse 2tsp of Lahloo Peppermint and five slices of cucumber in half a litre of fresh filtered water for about an hour or more, depending on how strong you like it. Strain the infusion and serve with sliced lemon and cucumber, squeezing some lemon and lime on top. This cranberry and lemon loaf is a seasonal favourite at Lahloo Pantry. Zesty, moist and fruity, with a bit of crunch from the sliced almonds, it’s perfect with a cup of Darjeeling and a good book. In a medium size bowl, whisk together flour, baking powder, and salt. In a separate bowl, whisk together sour cream, lemon zest and lemon juice. In the mixer beat the butter and sugar on medium speed until blended, it will take 2-3 minutes. Add the eggs one at a time, beating well after each addition until fully mixed in. Reduce the mixer speed and alternately beat in 1/3 of the flour mixture, followed by 1/2 of the sour cream mixture and repeat, ending with the last of the 1/3 of the flour mixture. Spoon into a loaf tin and bake at 190c for 25 minutes. Cover with foil and bake for another 25-30 minutes. For the glaze combine 1/4 cup lemon juice with 1 cup of icing sugar and drizzle on top. Garnish with fresh cranberries and sliced almonds. Our mince pies at Lahloo Pantry are always a huge success. The secret? 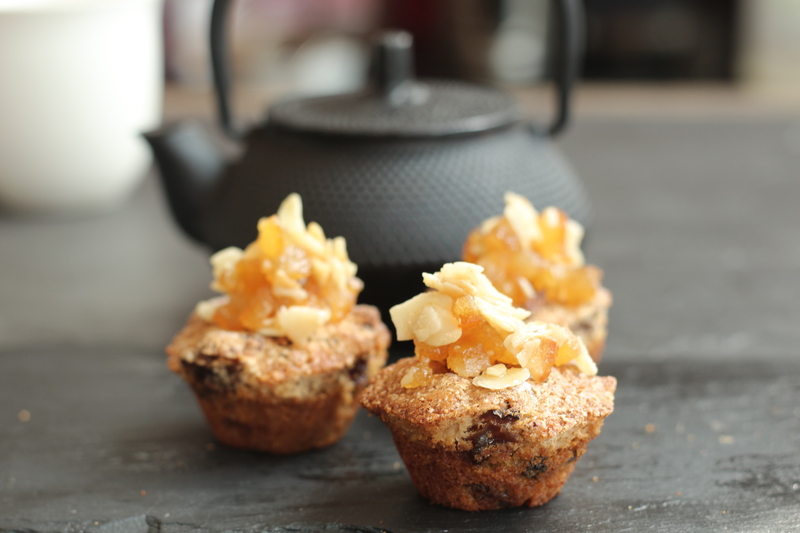 Really good pastry, but, above all, our incredible mincemeat, infused with zesty Lahloo Earl Grey. Here you can find out how to prepare it, ready for all your Christmas baking. Also perfect if you want to give some homemade presents to friends and family. Put all the dried fruit and spices in a bowl and mix thoroughly. Place the zest, sugar, tea and amaretto in a pan and heat gently until sugar dissolves. Pour over mixed fruit and stir gently. Cover and allow to sit for two days. After two days pack it into sterilized jars -better when they mature in a cool dark place for a few weeks!